Based on the same engine as Magic Candle 3, Bloodstone is IMHO a much better game than its better-known cousin (Magic Candle 1 is a true classic but the sequels were disappointing). 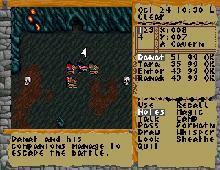 Magic Candle fans will feel right at home with the ability to control your party members separately, a good turn-based combat system, lots of spells, and the epic scope. Despite a cliché "kill the big woozle" plot, the game has many interesting side-quests and treasures to find. Highly recommended, but be prepared for an epic game that will take you dozens of hours to complete.